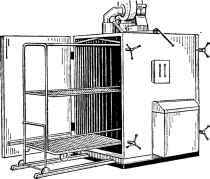 Disinfection chamber (installation) stationary or mobile sanitary-technical constructions intended for disinfection and disinfestation of clothing, bedding, shoes and other things. Depending on the thermal agent disinfection chambers are divided into steam-air (steam-formalin), steam and hot air. In gas-and-vapour disinfection chambers, warming up things is produced by steam to the temperature of about 80 to 98° at atmospheric pressure (without draining air). The camera is equipped with nozzles to spray or apparatus for evaporation formalin, are both steam-formalin disinfection chambers, allowing to disinfect leather, fur and other things at the temperature of 40-59 degrees. 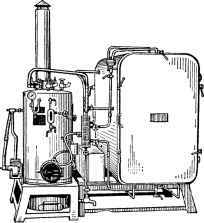 In steam disinfection disinfection chambers of things is steam at a temperature of 100 degrees or higher, atmospheric or small overpressure. Hot-air disinfection cameras are used for disinfestation of clothing, bedding and other items. Active agent in these cells is dry hot air at an ambient temperature of 80-120 degrees. Stationary disinfection cameras are used in medical institutions for disinfection and disinfestation of clothing, bedding and shoes are divided into steam-air (steam-formalin) and steam. Stationary disinfection room equipped trucks for hanging (installation), and transportation disinfected things, powerful ventilation and heating devices, electrical lighting and alarm system. The room in which you install a disinfection chamber, shares deaf by a partition into two compartments: the boot ("dirty") and unloading ("clean"). Fig. 1. Stationary disinfection chamber KDF-3. Fig. 2. Stationary disinfection chamber DXK-1,8. In a fixed camera KDV-3 capacity of 3.2 m3 (Fig. 1) to be disinfected things posted on a special truck, heated steam coming through the perforated pipes located on the floor. The camera is equipped with ventilation and heating system, used for drying handled things. Valves start steam and funnel for pouring in formalin vaporizer posted on the remote control. Stationary camera DXK-1,8 (Fig. 2) is mounted on two separate grounds: on one camera itself, on the other steam boiler. Luggage is available and without boiler per centralized steam supply. Disinfection chamber DKS-1,8 is a body is welded from steel sheet, which is surrounded by steel hoops. The camera has two doors for loading and unloading things. Clothes, previously put on a coat hanger, hung on strings pulled under the ceiling. The temperature inside the chamber is controlled by the mercury thermometer. Stationary disinfection chamber of CDFA-2 is available with a steam boiler SPM-1, designed for the pressure of up to 0.7 kgf/cm2. Basic parameters and dimensions of stationary disinfection chambers, produced by industry, are given in table. 1.